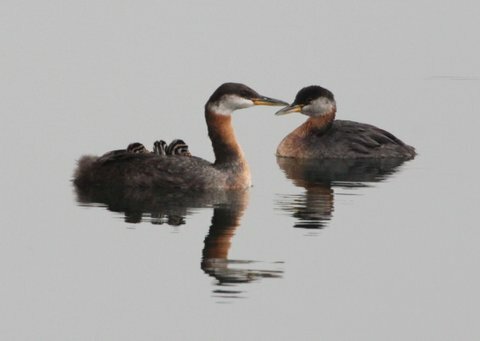 Friends of Sam Smith Park: RED NECKED GREBES HAVE EGGS! RED NECKED GREBES HAVE EGGS! The nesting platform closest to the beaver lodge is occupied by grebes and there are now two eggs! Hopefully they will be successful this year. 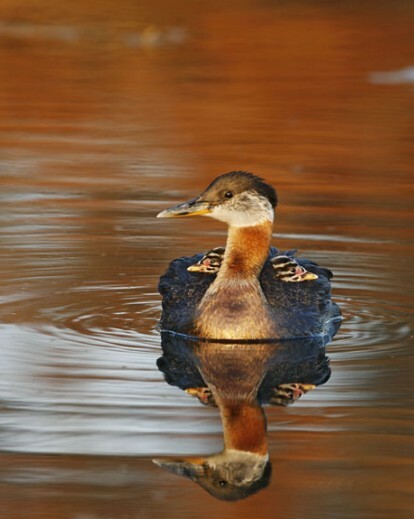 Red-necked Grebes typically build their nests in shallow water with marsh vegetation. Both male and female help build a floating nest made of plant material and anchored to emergent vegetation. The female lays two to four eggs. The young are fed by both parents and often ride on their backs. Shortly after hatching, they can swim by themselves. The Toronto Region Conservation Authority has been placing nesting platforms at Sam Smith for the past few years in an attempt to encourage these birds to breed here. There are breeding pairs successfully established in Bronte harbour. 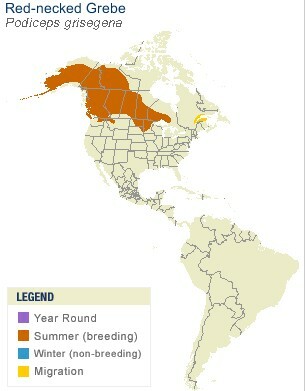 The map shows that we are at the extreme eastern edge of their breeding territory. wow, I hope they are successful!